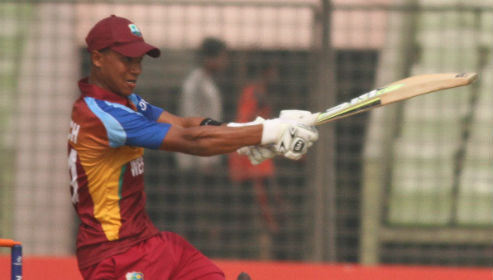 Tevin Imlach … anchored the Windies B run chase with an unbeaten half-century. 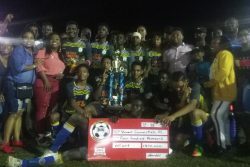 TAROUBA, Trinidad, CMC – Odean Smith unleashed a stunning half-century as Windies B dealt title-holders Windward Islands Volcanoes their fourth defeat of the Regional Super50 here Monday night, to virtually put them out of contention for the final four. Chasing 228 at the Brian Lara Stadium, Windies B pulled off a the three-wicket upset, to register their second win and move into third place in Group B on 10 points. They were in deep trouble with two wickets down and no runs on the board but Smith smashed a breathtaking 34-ball 64 while Tevin Imlach stroked an unbeaten 57 and Jeavor Royal, 44 not out, to power Windies B to an unlikely victory – their second of the tournament. The defeat left Volcanoes on seven points with just one win, 18 points adrift of leaders Jaguars and 11 behind second placed Trinidad and Tobago Red Force. Sent in, Volcanoes slumped to 40 for five in the 12th over as a clever combination of spin and pace ruthlessly blew away the top order. But right-hander Kavem Hodge came to his side’s rescue, bolstering the innings in two successive half-century stands – first with wicketkeeper Emmanuel Stewart (56) and then with Ryan John (44). Hodge put on 95 for the sixth wicket with Stewart who belted six fours and a six off 71 balls before perishing in the 36th over. The 21-year-old John provided the late fireworks, clobbering a four and three sixes in a 42-ball cameo as he posted a further 76 with Hodge for the seventh wicket. All told, Hodge faced 126 balls and counted four fours and a six before he was seventh out in the 48th over. Fast bowler Alzarri Joseph, pulled from the Windies one-day side to tour India because of fitness concerns, grabbed three for 54 from a full 10-over spell while the pacy Chemar Holder claimed two for 37. 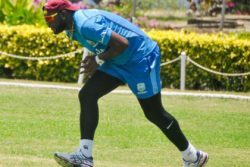 Windies B slumped early when they lost openers Keagan Simmons and Kimani Melius without scoring and even though Imlach and Kirstan Kallicharan (18) put on 40 for the third wicket, a clatter of wickets left the innings floundering at 70 for five in the 24th over. The revival started, however, when Smith arrived at the wicket to rip the Volcanoes attack to shreds, in a stunner laced with seven fours and four sixes. Importantly, he dominated an invaluable 80-run, sixth wicket stand off 65 deliveries with Imlach, which hauled Windies B right back into contention. When Smith was bowled by left-arm spinner Larry Edwards (4-47) in the 34th over, Windies B were still 78 away from victory but with plenty balls to spare and when Joseph fell after belting two sixes in 15, cool heads were required. The 21-year-old Imlach then showcased his maturity, anchoring the innings in a 110-ball knock with just two fours, as he helped add a precious 53 with Royal in an unbroken eighth wicket stand. Royal opted for attack, striking five fours and a six off 38 balls and impressively finishing the match with two slogs to the mid-wicket boundary off left-arm seamer Delorn Johnson in the 47th over.